Facebook is allowing users to access Instant games through Facebook messenger. This will mean that users need not download the game from the Play Store app on their smartphones and can play the HTML 5 Instant games offered within the Facebook Messenger application. 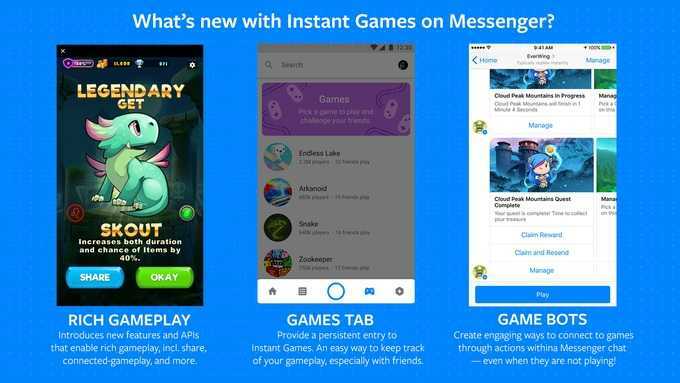 Instant Games on Facebook Messenger was first released in the United States in the month of November 2016. However, now it is offered for users all over the world, with fifty titles to choose from, including Pac Man and 8 Ball Pool. The Facebook Messenger now comes with a dedicated tab for Games and offers a curated option of the best games, but it is still in the testing stages. Facebook also announced two new features at the F8 Conference held some time back. A developer will be able to create a game bot that is able to communicate with the player, regarding game rewards and levels, almost similar to the way in which EverWing, a game, does. This was one of the most frequently requested features by gamers. 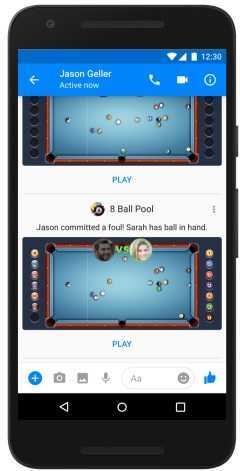 Instant Games on Facebook Messenger will offer support for this type of gaming instead of the usual single player game and it will come with a score leaderboard. A popular game by Zynga, Words with Friends, will be among the first such games offering the latest turn-by-turn title. It will offer simultaneous chatting features and is very suitable for chatting and back forth, which is one of the main aspects of a messaging application. Instant Games offers people something that they can use as a conversation starter, while waiting for friends to reply to their messages. In addition, the conventional app stores on smartphones are a mix of popular and mediocre games, making it difficult to select games. Downloads are also not always as smooth as desired and this has discouraged many users from downloading games from the Play Store. Instant Games will possibly draw users more into the family of applications on Facebook. According to a statement made by Facebook at the F8 conference, gamers have played Instant Games about 1.5 billion times during the past three months. By offering Instant Games on Messenger, Facebook has learned that the most successful platform for games would be where users already spend a lot of time, which is Messenger. Chat is the center of the mobile phone, so users are more likely to use the Instant Games, while chatting. As of now, there are no advertisements and nor are there any in game purchasing to be done. This means that Facebook and the developers of the game are not making any financial gains with the platform as of now. Among the launch games available, Endless Lake, Wordalot and Space Invaders are sure to be popular ones. Other games like Bingo and Solitaire as well as Basketball FRVR have also been added.